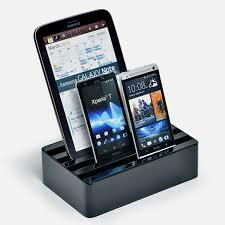 A good multi-device charging dock: Hallelujah! Eventually, I just decided that three phones, a tablet, and all the associated charging accessories was more than I wanted to look at, snaking out from the electrical sockets, across the kitchen counter. I thought to myself: there has to be way to organize this mess. Different phone models, different adapter types, different sizes, different covers or protective cases – a lot of variables, but you would think this was a common enough problem that a product to help would exist. The answer is no, with many seemingly fit-for-purpose products falling woefully short. And, herein lies the story of mobile devices, journey, innovation and hope. The journey comes from me searching for months and months for a product, where most were either ugly, cheaply built, or not very space efficient. Innovation occurs when creative ideas are needed to solve real-world and practical problems, and this comes in the form of the All-Dock docking station. It’s a KickStarter funded project to solve exactly my multi-device, kitchen cable disaster. Hope comes from the fact that I damn-well hope this makes me happy after waiting months for a product that hits the mark. The All-Dock unit is a rectangular multi-dock system with an integrated USB charging box, providing a way to connect your charging cables, keeping cable management in the box, and seating your devices. The unit I ordered was the medium size in the black colour. It managed to fit an iPad with a smart-cover, an iPhone 4 and iPhone 6 with protective cases. The construction was pretty impressive, with a combination of plastic and rubber in black. The top-plate fits snugly into the base and can be lifted-up without excessive force. The form factor is appropriate for my kitchen-counter top, and it uses the space optimally. The width and depth of the slots to seat the devices seems to be just the right size: they are wide enough to accommodate a variety of covers plus allow an appropriate tilt on the devices, not too snug and not too loose. My unit had four (4) charging ports and it shipped with shorter cables and cable ties. This is helpful, except I got mini-USB instead of iPhone 4 cables, which required me to coil-up my longer Apple cables (which I wrapped with the provided table ties), and the cables were able to fit inside comfortably. The holes that the cables pop-through are uniquely designed, with a hole plus a tapered grove that can be used to “hold” the cable adapter. I have not had any problems yet with cables falling back into the box. I have not have any problems with the amount of “slack” needed to pull-up your mobile device to detach the cable, either both because the provided cables seem to be the appropriate length and I sensibly coiled my longer Apple cables. The front of the unit has a notch that would allow you to press the home button while seated, which is useful, except that my iPad, being the largest device and most likely to benefit from this, is seated in the back. The charging worked well, and so far the charging time has met my expectations. In my research on the available products for this docking application, I had originally thought that having a docking station with a “fixed” adapter port would be better. However, there is just way to many kinds of adapters and devices and the USB charging station plus cable management approach seems to be the best way. There were some products out there that offered different fixed, and modular, adapter components that you can swap out, but none were quite right and future proofing is always an issue. I somewhat feel that cable management is an inevitable reality, so finding smart ways to do it has traditionally been a smart approach. Overall, I am pretty happy with the All-Dock multi-docking station so far. Admittedly, my impressions might be somewhat flavoured by the emotional journey of searching for a solution for months. If you order the unit, expect that it might take some time to ship – when I ordered mine, there were none in stock and had to be manufacturer. But, it was worth the wait. Herald the elusive multi-charging station equivalent of the unified theory of everything. The bottom-line: Definitely fits the bill for a multi-device docking station, so this is the one to get if you have more than one type of device.